Description: A map of the South Polar Region from 1919 showing the routes of several Antarctic explorations. 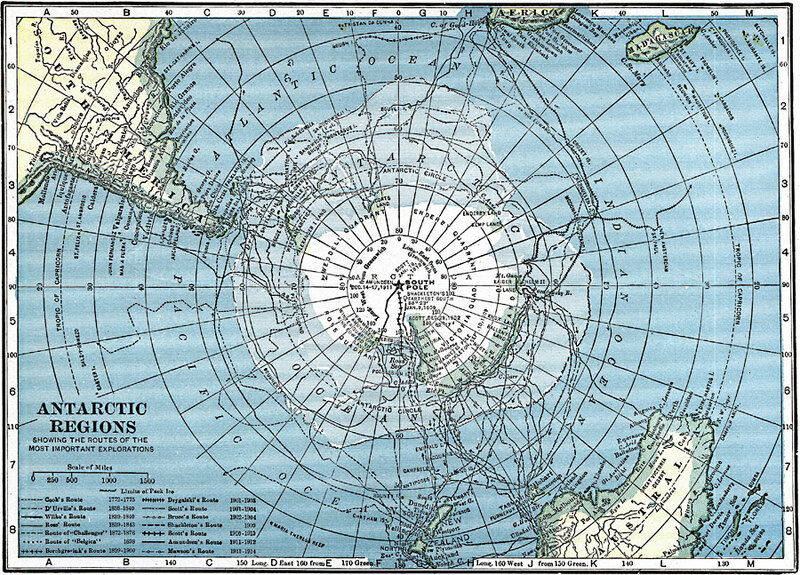 The map shows the route used and date Amundsen first reached the South Pole (December 14–17, 1911), and routes of Cook (1772–1775), D'Urville (1838–1840), Wilke (1839–1840), Ross (1839–1843), Borchgrevink (1898–1900), Drygalaki (1901–1903), Scott (1901–1904), Bruce (1902–1904), and Shackleton (1909). This map shows Antarctica divided into the Wendell Quadrant, Enderby Quadrant, Victoria Quadrant, and Ross Quadrant.